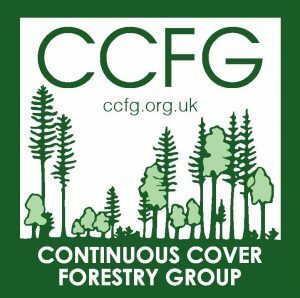 If you are a CCFG member and would like one of our new car stickers to display in your vehicle, please email Mandy at administrator@ccfg.org.uk to request one. Provide your name and postal address and one will be sent out to you shortly. Based either at Whitney Sawmills in Herefordshire or from home, this new post will be responsible for the smooth running of this small but growing charity (No. 1041611), at the heart of the timber supply chain. Salary: £8,736 for 14 hours per week (£21,840 per annum fte), plus reasonable expenses and generous holiday allowance for a post with an initial term of two years. To apply, please send to the e-mail address above your current CV plus up to 500 words describing the skills, knowledge and experience you would bring to fulfil the needs of the Job Description. 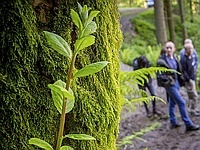 Coed Cadw, the Woodland Trust in Wales, is hosting a full-day conference to take in the views from the forestry sector, hear from woodland owners and managers who restore and manage Ancient Woodland plus get an update on support and funding available in Wales for these truly important sites. Ancient woodland is the richest land habitat of wildlife in the UK but only fragments now remain. These longstanding woodland sites are often threatened by issues such as plantations, over grazing and invasive species and will still contain important woodland features, which through careful management can be safeguarded. With sensitive transformation back to a mix of more native species with a greater diversity in age, these woodlands will become more resilient to other threats such as pests, diseases and climate change, ensuring they survive for future generations and also provide all the varied benefits of a well-functioning woodland ecosystem. This will be a chance to contribute to an open discussion and debate with practitioners and policy makers around practical and best practice management of degraded Ancient Woodland sites in Wales, chaired by CEO of the Institute of Chartered Foresters Shireen Chambers. See the flyer for more information on the programme and how to book. This international forestry workshop is being organized jointly by Pro Silva Bohemica and European Forest Institute and held in the Czech Republic from 25th to 26th October 2018. The workshop will be aimed at one of the hottest topics of today in central European forestry that lies in the necessity to transform pure coniferous even-aged forest stands. Attendees will visit the Exemplary Forest Units of Uneven-aged Forestry within the Forest District of Kocanda and will look at the transformation of 25 years of pure even-aged Norway spruce stands applying Pro Silva principles. See the letter of invitation for further details and how to book your place. This bibliography produced by Sam B. Manning and James D. Walmsley was published in August 2018 and builds on from Sharon Rodhouse and Edward R. Wilson’s two previous bibliographies published in 2006 and 2010 respectively, which compiled research published in the subject area of CCF. It features a selection of peer reviewed research papers, reviews and text books published between January 2011 and May 2018, authored by academics and forest professionals from across the world. This publication is freely available to CCFG members in the members area of the website. ProSilva’s press release following the Annual Meeting held in Weimar, Germany is now available here.